MormonInfo.org - FAQs - Does John 10:16 teach that the other sheep are the Native Americans? LDS simply assume Native Americans were the specific “other sheep” that Jesus had reference to in this passage. 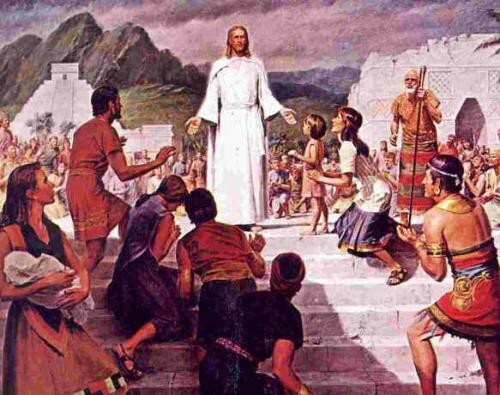 According to Mormonism, Israelites were “among the ancestors of the American Indians.” (The Introduction to the Book of Mormon used to say that the Israelites were “the principal ancestors of the American Indians.”) This statement of Jesus concerning the other sheep is supposed to give some legitimacy to the Book of Mormon and foster a curiosity to find out more about the Native American ancestry that He allegedly personally visited. The primary problem for this position is that Jesus said that these other sheep “are not of this fold.” What fold was Jesus speaking to? The passage is clear that He was speaking to the Jews (vss. 19 and 24). If that is the case, then it does not seem very likely He was referring to some other Jews in some other location. It seems more likely that He had non-Jews in mind, and the early Church history book of Acts shows precisely how the gospel moved to the Gentiles (e.g., Acts 10). Christ and His disciples were certainly sent to the Jews first with the gospel (Matthew 15:24 and Romans 1:16), but only after He was rejected by His people, crucified, and risen from the dead did the focus shift to teaching “all nations” (Matt. 28:19). This is why most Bible commentators think that these other sheep refer to Gentiles, and thus they refer to much more than Native Americans. (Basically everyone except Mormons thinks that all Native Americans were Gentiles. For the problems Mormons have here, see Dennis Monokroussos’ review of DNA vs. the Book of Mormon.) The gospel has gone out not only to the Native Americans, but to the Chinese, the Russians, etc., and it did not need individual appearances of Jesus to accomplish it. This gospel makes both Jew and Gentile into “one fold” with “one shepherd.” As the Apostle Paul said, “There is neither Jew nor Greek… for ye are all one in Christ Jesus” (Galatians 3:28). Firstly, "not of this fold" doesn't necessarily mean, anyone that isn't a Jew. If you think about a group of sheep in one fold, you can have many different breeds, colors, and such but they are all in one area. So, "this fold" is more than likely referring to the people in the areas mentioned in the Bible. The "other sheep" are those in the Americas because they were not of the eastern continental fold.